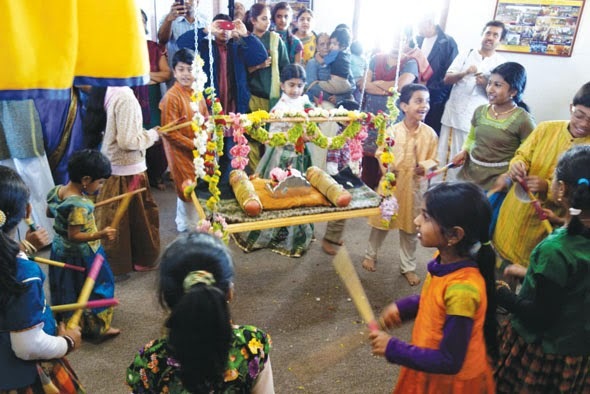 Global Organization for Divinity and Namadwaar will conduct its annual grand celebration of bhakti and Bhagavata Dharma, from December 21 to 27 this year through a 7-day “Madhura Utsav” (sweet celebration). The Utsav will be filled with celebration of Bhagavan through song, dance and listening to His stories through a 7-day “Sri Krishna Leela” discourse series by Sri Ramanujamji, disciple of His Holiness Sri Sri Muralidhara Swamiji. Daily daytime events will be held at Namadwaar Prayer House located at 3642 Bailey Ave, Manvel TX 77578, while the evening Bhagavatam discourse will be held at Sri Meenakshi Temple Kalyana Mandapam in Pearland and is co-sponsored by Meenakshi Temple Society. Daily events through the day (at Namadwaar) include chanting Thiruppavai (6 am), complete Srimad Bhagavata Moola Parayana of 18000 slokas in 7 days (7am-2pm), Procession of Sri Krishna-Sri Radha in different vahanas (9:30 am), Ashtapadi kirtan-Sampradaya bhajans with Sri Jayadeva’s Gita Govindam (1-4pm) and Divya Nama sankirtanam (9:30 pm). There will also be special events on certain days at Namadwaar, such as Radha Kalyanam (Dec 27, 9 am), Govinda Pattabhishekham and Anna Koototsav (Dec 25, 9 am) and Nandotsavam (Dec 24, 1:30pm). The evening program (Dec 21-27) will begin from 5:30 pm at Meenakshi Temple with the “Madhura Natyam” segment where various Houston dance schools will offer their talent to Lord Krishna through performances. On Dec 25, children of Gopa Kuteeram from around the USA will present “Srimad Bhagavatam – A Musical Play”. This cultural segment will be followed daily at 6 pm by the highlight event – Sri Krishna Leela (discourse in English on the 10th canto of Srimad Bhagavatam) by Sri Ramanujamji. Sri Ramanujam ji, who has visited the Houston area several times before, is an excellent speaker who has absorbed the intricate essence of our scriptures directly from his Master. His insightful discourses throw beautiful, meaningful, practical light on the subtle aspects of bhakti and our Sanatana Dharma. His discourses on Srimad Bhagavatam are brilliant and instill in us love for Bhagavan, love for the path of bhakti and love for this great Purana itself. Add to this the fact that this year’s discourses will focus in detail on Sri Krishna’s ever-new, refreshing and deeply significant leelas, and the whole event becomes doubly sweet. Everyone is welcome to participate in this unique celebration. All events are free and open to the public. Mahaprasad will be served. Prasadam and flower sponsors are welcomed for this auspicious event. If you find this divine cause worthy of your generosity, please call 281-402-6585. Global Organization for Divinity (G.O.D.) and Namadwaar Prayer House aim to promote peace, harmony and universal love amid cultural diversity. They are involved in several spiritual, cultural and social activities in the Houston area. For further information about the event or about G.O.D. or Namadwaar, call 281-402-6585, email houston.god@godivinity.org or visit www.godivinity.org.